So, hey. How ya doing? I guess it’s been a little while, huh? If you were to check my blog each year at around this time of year, you would probably find the same thing – few and far between posts. See, the thing is, I get in a funk this time of year. As it gets colder and there is less and less daylight, I get crabbier and crabbier and kind of get in a funk of sorts. I try not to, but it just happens. Every year. Winter is NOT my favorite season. At. All. Well, I apologize. I will try – TRY – to post a little more often this winter season. But, I’m not making any guarantees or promises. Just hang with me, okay? I am gonna warn you for this post…IT. IS. GOING. TO. BE…….LONG!!!!!! So, first things first…races #29 and #30! YES! I hit my goal of participating in 30 different organized running events this year. The next pic is the map with route and elevation of the run. Yes, it was HILLY! As much as I disliked the hills, I liked the hills because they were challenging and I am always up for a challenge. And lastly, here is a look at my splits, as well as my husband’s splits. Can you tell which miles we both struggled on? Mine are on the left (obviously!) and Al’s are on the right. We thought they were kind of interesting. Our next race took place on Thanksgiving Day. 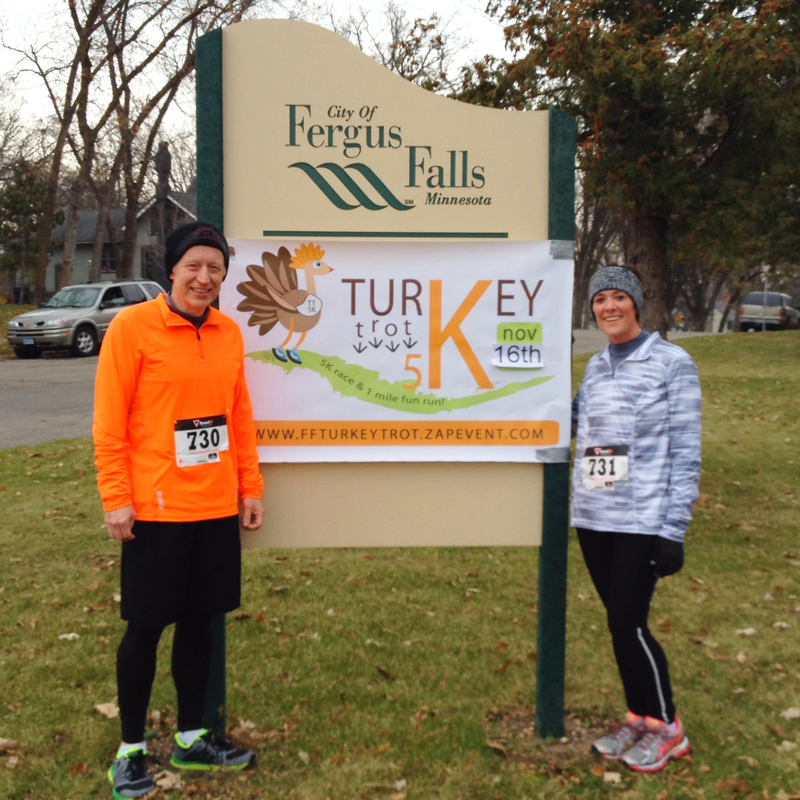 Our YMCA held it’s third-annual Turkey Day 5K. This year, however, was a little different; the race wasn’t timed. It was just a fun run. Okay, back to the YMCA Turkey Day 5K. I have to admit I was a little bummed with my time. Because it was the last race of the season, I was really hoping that I could get under 30 minutes. I thought I was pushing myself, but it was kind of cold and there were a couple of inclines that got me. 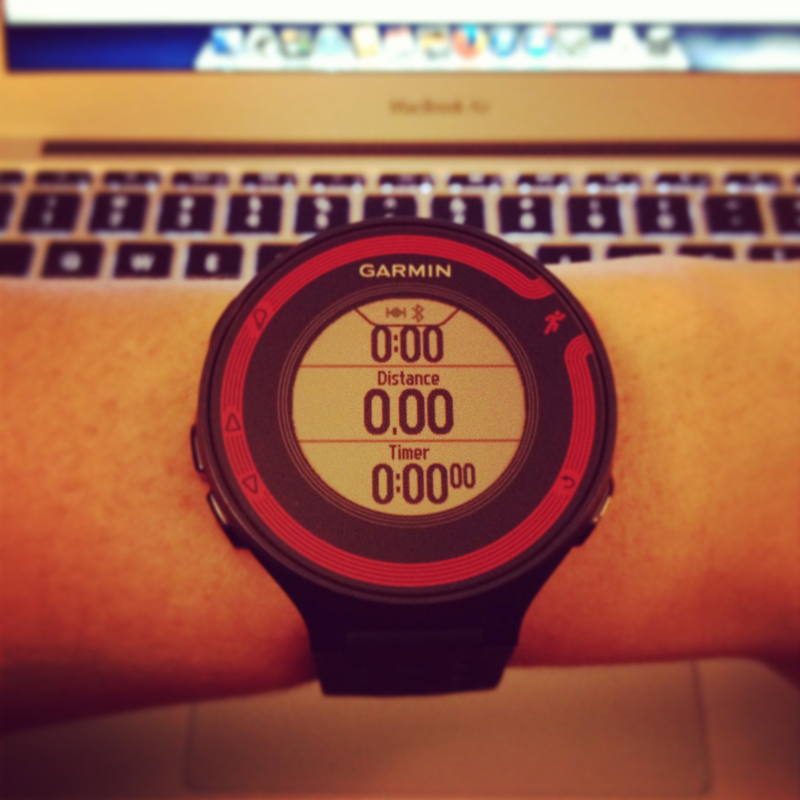 My time, according to my new watch, was 30:14. Yes, I am still happy with my time, but I was just hoping to get under that dang 30-minute mark. Al finished the race in an even 24:00 minutes. Out of the 200 or so runners, Al guessed that he came in within the first 20 runners. So cool. He’s so awesome! 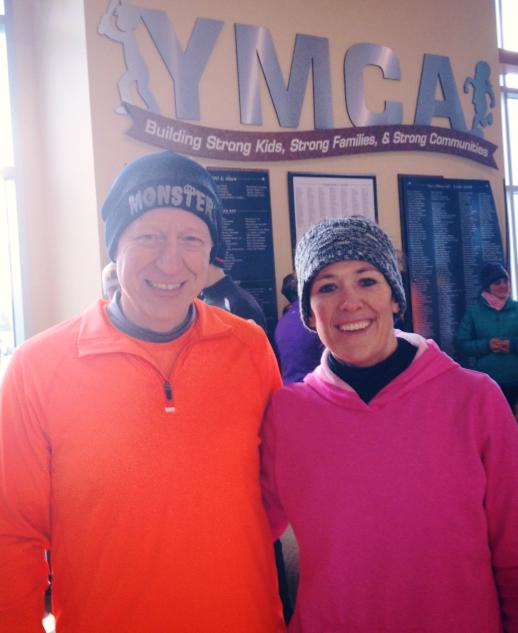 After the race while we were warming up inside the YMCA. 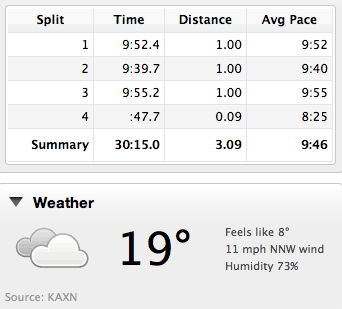 A look at my splits, as well as the weather. This is just a few pieces of information I can now look at on the GarminConnect website after I upload the information from my watch. (Can you tell I am slightly excited about it?!?!) There is so much information, it’s really kind of cool. Especially, if you are a data geek! There, race reports complete. Onto some not so fun stuff! Yes, plural. As in more than one doctor appointment since the last time I blogged. First things first, ATTENTION MEN……you may want to skip this part! Almost one half of women who have babies have some degree of prolapse. Those who have bigger babies – my son was 9-pounds, 3-ounces – have an increased chance of prolapse. Keeping in mine, that my baby is now 20-years-old. Still floors me. Anyway, my OB/GYN said that basically, if I can deal with it, to deal with it. If it gets bad enough, there are other options. But for now, if I am good with it, just go with it. So, that is what I am going to do. Just go with it. At least I know what it is and that for the most part, I’m normal! Well, as normal as I can be. 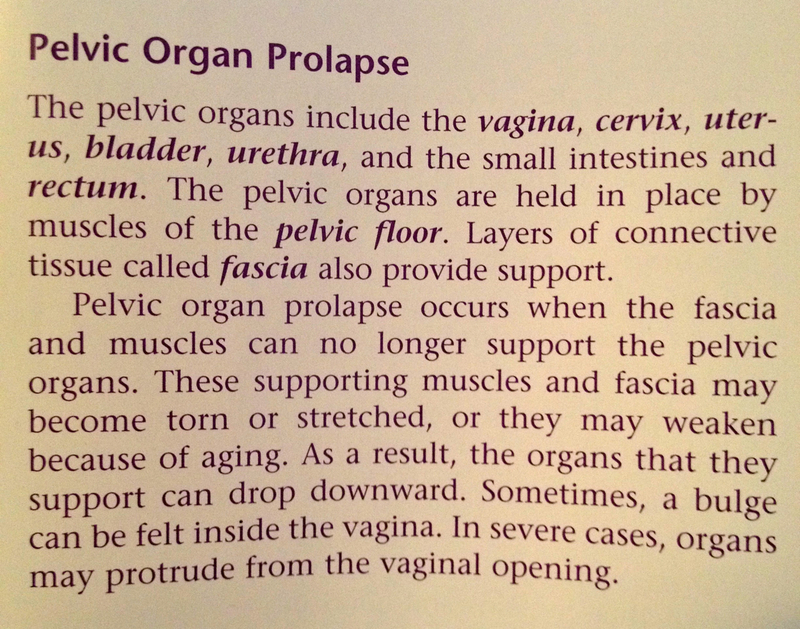 In addition to the whole uterus-might-be-falling-out-thing. I have been dealing with a couple of other issues. Seriously, you turn 40 (well, okay, I’m 41) and your whole body starts falling apart. Sad thing is, this is the healthiest I’ve been since probably high school. Anyway, I’ve been dealing with some major heartburn/GERD issues lately and have been scarfing down Rolaids/Tums like there’s no tomorrow. Well, after I posted on Facebook asking friends what they felt worked best for heartburn, I had several people tell me to go get checked by the doctor. So….I did. She gave me a prescription for Pantoprazole. I have to take it for two weeks. If it’s not better, I have to call her back and then I get to have a scope done. Yippee. I also talked to her about the shoulder pain I have been having in my right shoulder that I have been dealing with. Yes, dealing with. I’ve had it for the last oh, four to six months or so. I just thought it would get better on its own. Guess not. It has actually gotten worse. It even wakes me up in the middle of the night and I can’t ever sleep on my right side anymore. So, the doctor’s prediction? A torn rotator cuff. Really? Really? I don’t remember injuring it or anything. AARGH! Whatever! Because she wasn’t 100 percent positive, today, I got to have an MRI done. Oh, joy! Seriously, those things are just awful. Awful. Now, we play the waiting game. And if all that isn’t bad enough…………I have a hearing appointment on December 30. Yes, you “heard” me right, a hearing appointment. I’ve been struggling for quite some time and to be honest, kind of faking my way through it when talking to people. I figured as long as I was talking to the doctor about all that other crap, I may as well talk to her about my hearing. When I visited the doctor, she had a student doctor with her and my doctor let the student do a prelim hearing test on me to see if a “real” hearing test was warranted. Obviously, being I have an appointment scheduled, the test is warranted. I have to say, the tests were pretty cool. The student did a couple of hearing tuning fork tests on me. The first, the Weber’s test, is where the tuning fork, once activated, is place on my forehead and then I was told to say which side I could hear better with or if there was no difference at all. Oddly, the sound was WAY louder on my left side. I could barely hear it on my right. Seriously, it was so weird. The second test, the Rinne’s Test, is where the tuning fork was placed behind each ear after it was activated. She did my left first and I could hear it, but it wasn’t super loud by any means. Then, she did the right side and WHOA!, the sound was about half as loud as it was in my left ear. Again, it was weird, kind of bizarre and almost surreal for some reason. At any rate, both the doctor and the student concluded that a hearing test was definitely warranted and so, December 30 I get to go see an audiologist! Yeah, me. Seriously, I am so excited. I don’t give two cents if I end up with hearing aids. If I can hear, I am totally 100 percent fine with it. I just hope everyone else is! Now, let’s talk about something a little more upbeat…goals! I set a goal this year to do 30 organized events/races. I achieved that. I don’t necessarily want to do that many races next year, so instead, I set a goal of completing at least two half-marathons. Yes, I know I said once upon a time if – and that was a pretty big IF – I ever did a half-marathon, I would only do one and then never do one again. Yeah, that didn’t work out. I’ve now completed two half-marathons. And now, I want to do two half-marathons…in one year! Crazy. Well, crazy for me. I know for some, half-marathons are no big deal. But to me, it is a BIG deal. 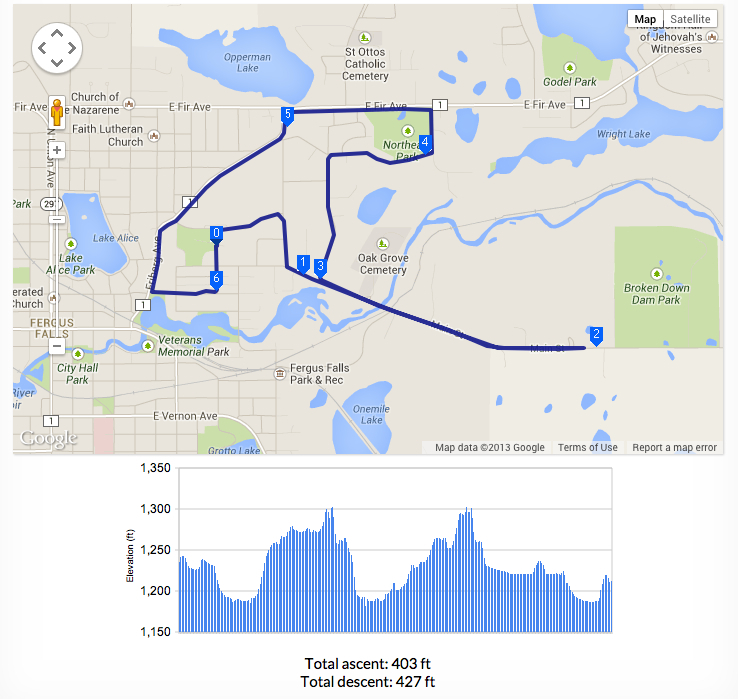 My hubby and I have already signed up for one half-marathon…the Fargo half-marathon in early May. I’m kind of excited about this, but at the same time, extremely nervous because this means some or much of my training will have to be done on a treadmill. And most of you know how I feel about treadmills. I have been running on one at our local YMCA, but it is SO not my favorite. 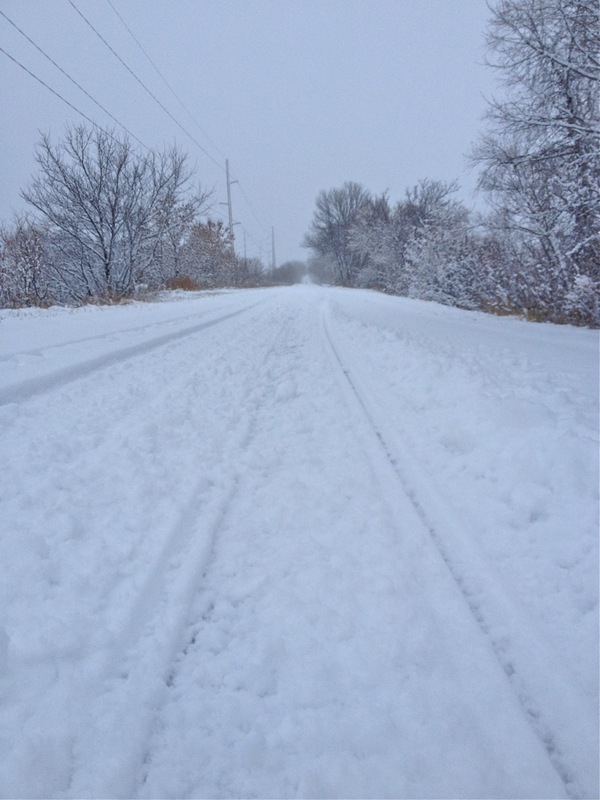 I will run outside – yes, even in the snow (see below) – before running on the treadmill. Unless, of course, it is beastly cold out like it currently is in our town! 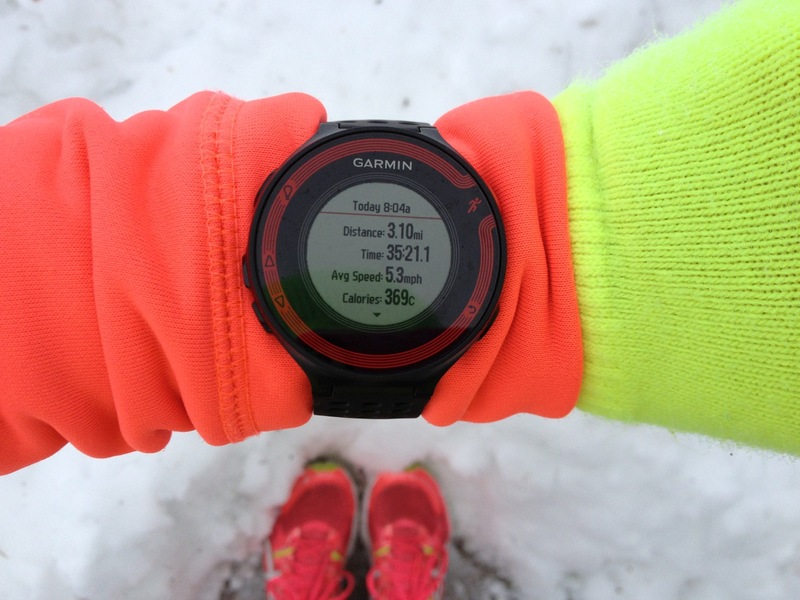 Running on snow-packed trails really adds time to you time! As for our other half-marathon, we are not sure yet which one. We know we want to do a destination run, but we are unsure where we want to go. We are thinking sometime in October, late November (not early because of elections…my newspaper editor husband just might be a bit busy during this time) or early December. We would love to do another Rock ‘n’ Roll series race, but not sure where. We are now thinking San Antonio, Texas or Vancouver, British Columbia. However, the Canadian one scares me just a bit because I’m thinking that race might be kind of hilly. I know, I shouldn’t let that scare me. And it doesn’t when it comes to a 5K or a 10K, but 13.1 miles, ummmm, not so sure. Other states we are looking at, although the race wouldn’t be a Rock ‘n’ Roll series one, include Florida, Oregon, Idaho or maybe even Maine. We are doing some research and will make a decision maybe after the first of the year. As for other running goals, I really want to work on trying to get a little faster. I really would like to get under the 30-minute mark for my 5K’s and I would really, really, really love to be consistent at getting under an hour for my 10K’s. I will admit that I think the treadmill will help me with this. When I run outside, I let myself slow down and don’t push as hard as I probably could. On a treadmill, it’s not quite as easy to slow down. Plus, it might be one way for me to tolerate the treadmill – to play on it and push myself. I guess time will tell. As for my weight, which I know you are all wondering about, right? For right now, it has been staying mostly the same. Although I did do a little experiment awhile back. I talk with my Weight Watchers members on a regular basis about how much our weigh can fluctuate on a daily basis. And, that there are so many factors/variables that can cause this fluctuation, including but not limited to sodium intake, water consumption, activity and more. I do typically weigh myself every day, but I only pay attention to what I weigh each Friday. My weight gains and losses only count each and every Friday. My experiment, or whatever you want to call it, is that I weighed myself almost every day for a week AND kept track, just to show just how much it can fluctuate. On Friday, November 22, I weighed 140.8. I didn’t weigh on Saturday or Sunday, but then on Monday, November 25, I did and my weight jumped up to 146 something (I didn’t really pay attention to the “. whatever” again until Friday. My weight on Tuesday, November 26 was 143.?. On Wednesday, November 27, it was 144.? My weight on Thursday, November 38 was 145.? and then on Friday, when my weight actually counted, I was 141.8. So, even though during the week, I had gained/loss about six or so pounds, my actual true weigh gain/loss was that I was up one pound. I was okay with that. I will see what happens tomorrow, when I “officially” weigh in again. My guess….up one or two more pounds. YIKES! 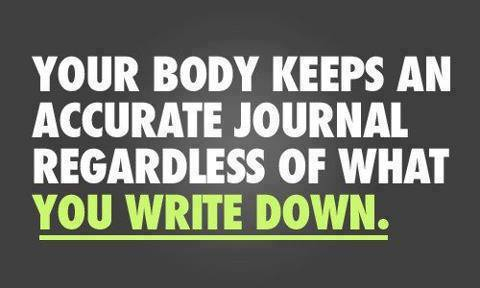 Like many of members this time of year who struggle and tell themselves it’s time to get back on track. They are right. IT IS TIME! 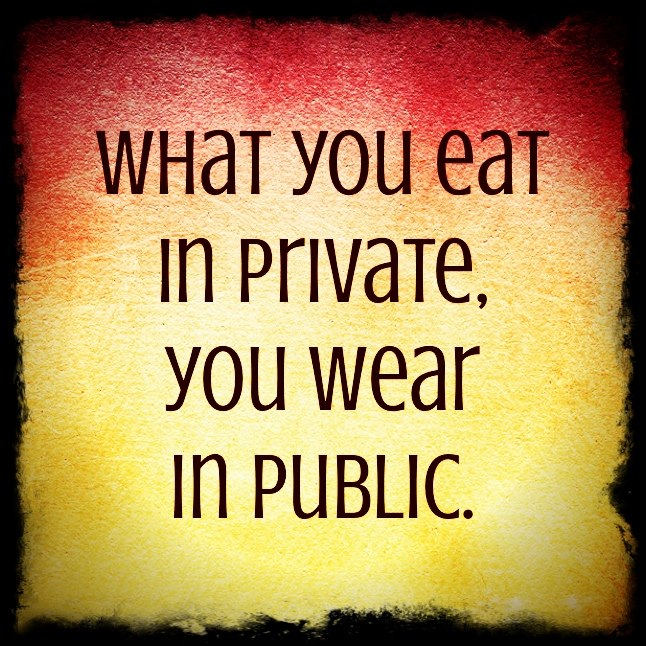 Time to get my head out of my arse and get back to plan and NO MORE eating in private. Enough is enough. I won’t let myself gain as much as I did last winter – about 10 pounds. It was awful and I don’t want to feel like that again. Well, this post is definitely WAY TOO LONG. It’s time to say goodnight! Take care my dear readers. And remember, you can always find me on Facebook and also, you can find me on Instagram (#celbeam). I would love to have you follow me!